Religious liberty, America’s “first freedom,” has fallen on hard times lately. A few years ago, a survey showed that nearly 40% of Americans believed the First Amendment’s protections “go too far.” That number has decreased in later surveys (thankfully), but it’s still a troubling sign. Meanwhile, we are seeing more and more legal battles against religious people whose convictions are not in line with the ideology of the Sexual Revolution. What are the cultural trends leading to a diminishment of religious liberty? Trend #1: Religion is personal and private, not public. More and more Americans see religion as something personal and private, a belief that you hold for therapeutic purposes. It’s about feelings that are true for you, not facts that concern the whole world. The American people have not always had this view of religion. When he was running for president in 1960, John F. Kennedy had to make a speech to assure people that his Catholicism would not negatively impact his governance. Interestingly, he had to make that speech because (1) Americans believed religion mattered for public life and (2) he needed to convince them that, in his case, his private beliefs would be innocuous. In other words, he had to make the case that religion is personal and private, precisely because so many Americans saw religion as something public. The idea that religion is a private affair has existed for a long time, but it has become “the default position” on religion in recent years – to the point that religious people have to make a case for why religion should matter in the public square or in the realm of politics. Over time, this trend leads to less patience with people who believe that religion impacts all of their decisions. The more devout you are in public, the more strange you seem in a society where religion is pushed to periphery of private prayer or self-fulfillment. Trend #2: Freedom of religion is narrowed to freedom of worship. In recent years, it’s been interesting to see how “freedom and worship” and “freedom of religion” are used simultaneously, as if they are the same thing. 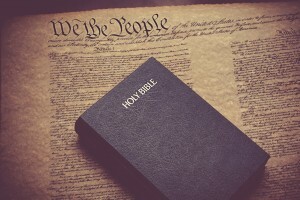 The First Amendment guarantees the “free exercise of religion” not the “freedom to worship as you please.” Or, to make the point clearer, we should say freedom of worship comes under the broader umbrella of freedom of religion. Many Americans believe that as long as churches are free to teach and preach what they want, we have freedom of religion in this country. But this diminishment of freedom to a “worship service” is very different than the freedom to live out one’s religious convictions in everyday life. It walls off religion and consigns it to rituals and values that are personal and private (see Trend #1). But Christianity is not just about one’s private beliefs; it’s about a way of life. It’s one thing to say “Jesus is Lord of my heart” and another thing to say, “Jesus is Lord of all.” Christians affirm both of those truths. In ancient Rome, the Caesar wouldn’t have cared about a messianic Jewish sect if the early Christians had merely been saying, “Jesus is my personal Savior.” No, Caesar was threatened because people were “turning the world upside down” by proclaiming another king, Jesus (Acts 17). Likewise, Nebuchadnezzar wouldn’t have cared if the three Jewish exiles had worshipped their own God in private. He was furious because they would not bow down to his statue. Trend #3: Fewer people claim to be religious today. The Pew Research data shows the rise of the Nones – the percentage of people who check ‘none’ when asked about their religious affiliation. Many nominal Christians in the past are now unaffiliated with any religion. Generally speaking, it’s harder for nonreligious people to understand the depths of religious conviction and motivation. For example, it’s usually easier for a Christian, rather than a secularist, to understand the plight of a Jewish person who will not work on the Sabbath, or a Muslim prisoner who will not shave his beard. Religious people understand these conundrums, even if they don’t share the same convictions. Why? Because in the case of Islam and Judaism, we’re dealing with a comprehensive worldview that impacts all of life – private and public. We may not share the same worldview, but we understand that worldviews matter. Non-religious people may have a more difficult time understanding the depth of these convictions and the sensibility of religious conscience. It’s interesting to see secular journalists write about religious people as if they can “prod them along” to change deeply held beliefs about marriage, or the exclusivity of their religious truth claims, etc. Trend #4: The Sexual Revolution has its own vision of sin and salvation. The Sexual Revolutionaries offer different answers to those questions than do most religious people. For many today, traditional notions of sexual sin are not problematic, but the very notion of sin in sexuality is the sin from which we need deliverance. Repression is bad; liberation is good. But Christianity has a different set of views and norms when it comes to channeling sexual expression in ways that maximize human flourishing. The Sexual Revolution’s ideology must resist Christianity in order for all (or at least most) sexual behavior to be treated as “normal,” and equally true and good. Christians in North America will face many challenges in the future. Religious liberty debates are likely to increase as these trends accelerate. Let’s not be shocked when people don’t understand where we’re coming from. Instead, let’s take time to back up and put these debates in context, always giving faithful witness to the gospel that never changes. Copyright © 2016 Kingdom People, All rights reserved.